If most of your errands are of the in-town variety, it's worth pointing out that the 2011 Nissan Quest's 19-mpg city fuel economy is best-in-class. And, inside, an interior that looks less utilitarian than most minivans gives this box-on-wheels a more premium feel. It has a lot of room for the passengers in the back. The first problem with the vehicle was it was not giving me accurate mileage but I think it was a Nissan thing cause they fixed it for free. For the longest the audio just stopped working on the car also. I haven't listened to the radio in years and the DVD player in the back stopped working almost immediately. Also I keep having problems with the brakes and even after I replaced with new ones they're still faulty. Overall, I do not like the style of the van, it is short in the front and super wide in the back and no space in the trunk. 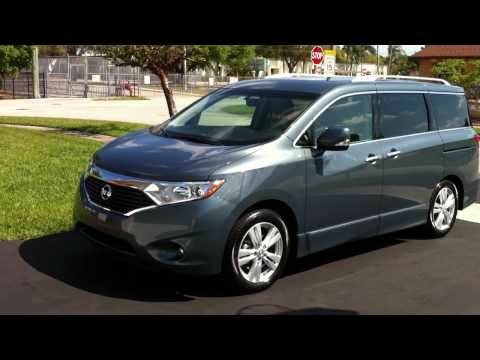 Slate grey 2011 Nissan quest. Since purchasing this vehicle a year ago, I have yet to have any problems. It is very comfortable to drive and has a lot of space if you have a large family. There is a second set of back seats that fold down for more space. It has a CD player and your typical radio buttons, no navigation. Ever since owning a Nissan quest, I look forward to owning another in the future (quest or other type of Nissan). It is spacious and able to accommodate more people than normal minivans. It is a mini van at times it is slow and other times stalls still when it works it is fine. We mainly have it for when my mom looks after kids. It is pretty spacious and easy to drive. It does not require too much maintenance but it works fine. It would be good to take it to the dealership to get fixed once in a while to make sure it is in good working order and not get stuck in the freeway. NISSAN IS RECALLING CERTAIN MODEL YEAR 2011-2012 NISSAN QUEST VEHICLES, MANUFACTURED FROM JULY 29, 2010, THROUGH FEBRUARY 21, 2012. DUE TO SOFTWARE PROGRAMMING, WHILE DRIVING AT SLOW SPEEDS OR IDLING ON A DECLINE WITH ¼ TANK FUEL OR LESS, THERE MAY BE AN INSUFFICIENT SUPPLY OF FUEL TO THE ENGINE. AS A RESULT, THE ENGINE MAY STALL. NISSAN WILL NOTIFY OWNERS, AND DEALERS WILL REPROGRAM THE FUEL PUMP CONTROL MODULE, FREE OF CHARGE. THE SAFETY RECALL IS EXPECTED TO BEGIN DURING MID MARCH 2012. OWNERS MAY CONTACT NISSAN CUSTOMER SERVICE AT 1-800-647-7261.